August 05, 2005, L. G. Crabo. Eilema bicolor, the bicolored moth,is small to medium sized (FW length 13–17 mm) aptly-named gray and yellow moth that occurs in most of British Columbia and adjacent states east of north-eastern Washington during the summer. Most of the moth, including head thorax, and most of both wings and abdomen are dull medium to dark gray. 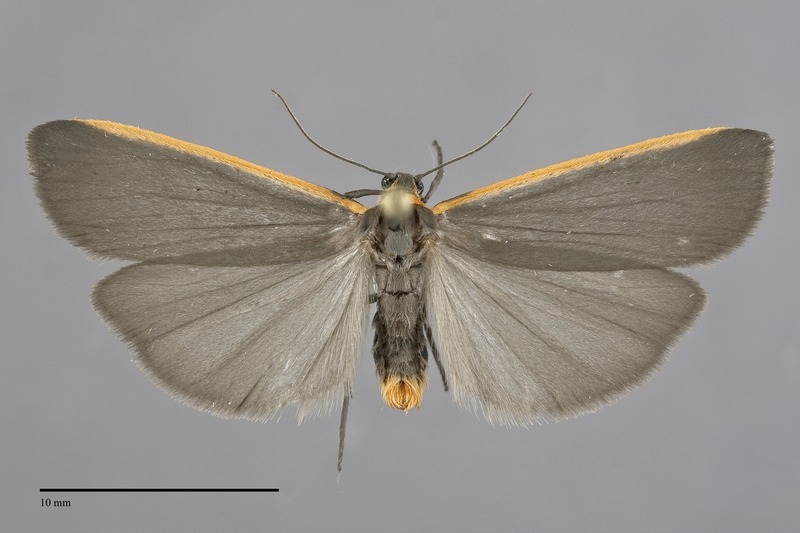 The collar, tip of the abdomen, and costa of the forewing are contrasting bright ochre yellow. 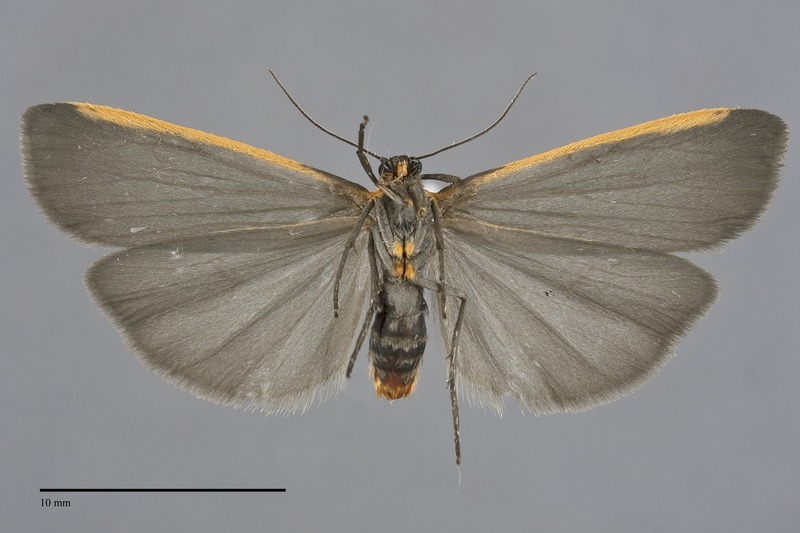 The forewing is relatively long. This moth is unlikely to be confused with other species in our area. This is a northern species that is widely distributed across Canada, primarily in boreal conifer forests. The distribution of E. bicolor is limited to British Columbia, extreme north-eastern Washington, and western Montana in the Pacific Northwest. In British Columbia it occurs almost everywhere except near the Pacific Coast and in the southwest part of the province. E. bicolor is widely distributed across boreal North America from Labrador and Massachusetts to Yukon Territory and British Columbia. It ranges south in the Rocky Mountains to southern Colorado. This species is a foodplant specialist on tree lichens, and particularly favors lichens growing on conifers such as spruces and firs. Adults occur in late summer and early fall. They are nocturnal and come to lights.